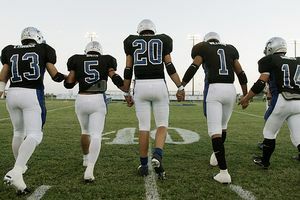 In rural Texas communities, six-man football is a way of life. Richland Springs and Cherokee are tiny towns located at opposite ends of Texas’ San Saba County on the northern edge of the state’s picturesque Hill Country. The county, which is almost the size of Rhode Island, has a population of about 6,000. Work and play for many residents consist of ranching and hunting. There’s room for both among the live oaks, mesquites and cedar trees, though rural towns in the state continue to lose folks who move to the big cities looking for work. Cherokee and Richland Springs have high school enrollments of fewer than 100 students each, which qualify them to play a hybrid of football that has become a staple in many communities in western and central Texas — six-man. Richland Springs’ titles are proudly displayed outside the team’s facilities. Both schools’ six-man accomplishments are displayed on large wooden signs erected in front of the schools — each institution houses kindergarten through 12th grade. Those signs also identify each football program’s place in six-man social status. Richland Springs has won state championships in three of the past four seasons, including 2006 and ’07. As of their Oct. 24 win over Rochelle, the Coyotes (two syllables, please; don’t pronounce the “e”) haven’t lost a regular-season game since 2001, and they won a mythical national championship last season. The sign in front of Cherokee also boasts three state titles, all won during the 1970s. Cherokee is now officially among the smallest of the small, placed in Texas’ Division II of six-man football. (In 2006, the governing body of state high school athletics, the University Interscholastic League, ruled that high schools with fewer than 66 students should compete in their own six-man section.) In an unincorporated town of about 175 with one blinking traffic light, Cherokee has 52 high school students. About a third of the enrollment comes from a nearby children’s home. The senior class numbers 11. The Cherokee Indians haven’t reached the playoffs in four years, even with the realignment, and opened this season with two losses. But they won the next five, and the five rows of wooden stands that make up the home side of the football field are beginning to fill again under first-year head coach Michael Brand. Things are going so well that Brand ran out of the little tomahawk helmet decals that he awards for outstanding play. Everyone knows football is big in Texas. 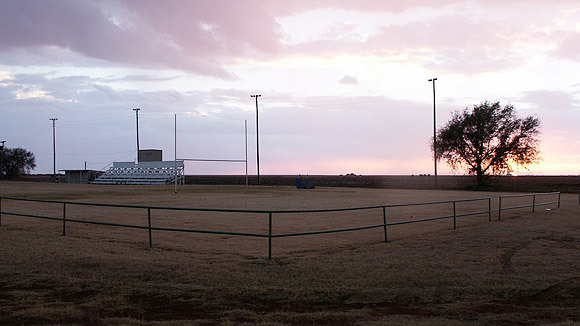 Even in the smallest of towns, football is a way of life. 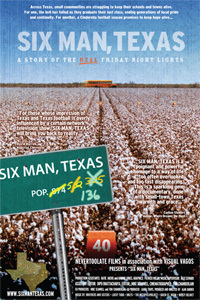 The film “Six Man, Texas” examines a town that is struggling to survive and keep its schools open while rallying around its six man football team. Small town, big football dreams..
Aquilla, Texas: A six man football town. Coaches: What makes six man special. For more on six-man football, check out Jeff Miller’s feature on Texas six-man football and his look at the state’s six-man mercy rule. There’s a saying in Texas that if you weren’t born here, you got here as soon as you could. That’s pretty much what happened with six-man football. It was the brainchild of a Nebraskan named Stephen Epler, who in 1934 devised a way for boys attending small, rural schools to play football. Six-man reached Texas four years later and is played primarily in rural communities throughout the West and into Canada. Six-man is played on a smaller field (80 yards long instead of 100, 40 yards wide instead of 50) in a smaller amount of time (10-minute quarters). All six players are eligible to run or catch the ball. There must be two exchanges instead of simply the snap from center, meaning the back who receives the snap can’t run beyond the line of scrimmage. The distance for making a first down is 15 yards. PAT kicks are worth two points while running or passing is worth one. Field goals are worth four points, but neither field goal attempts nor punts are terribly common. Onside kicks, which must cover 15 yards to be recovered by the kicking team, are commonly used since kickoff returns can turn into touchdowns with one or two solid blocks. While many rosters can reach 20 or more players, there’s usually a core of seven or eight who play most of the game on offense and defense. “You have to be pretty fast, and you’ve got to have a lot of endurance,” said Cherokee sophomore Jesse Perez, in his third year living at the children’s home. Junior Duncan Roberts is a burly outdoors kid who has been hunting since he was 3. At 5-foot-8 and 190 pounds, he’s the Indians’ starting center and also was their leading receiver against Brookesmith with two touchdown catches. Roberts begrudgingly admitted he might have been open a few other times. Between hiking, blocking and getting open, “There’s a lot to remember,” Roberts said. Six-man quarterbacks have more options than their 11-man counterparts. Huntress, who has even been invited to help the UIL hand out championship trophies, said he was first attracted to six-man by the high scoring and the character of the people who played and followed it. “They took me in, adopted me, because I cared,” he said. Brand immediately experienced the hospitality of the six-man community last summer when he took over the Indians after just one season as the team’s assistant coach and a veteran head coach gave him a copy of his playbook. Devotion to the Coyotes covers all age groups in Richland Springs, which has a population of about 350. You are good At Foot ball and I think you can beat them. You are the best and you are the best COYOTES. Then there’s Pearl Cantrell. She turned 100 last March and attends most home games — though her bronchitis makes it difficult for her to spend much time outside. Since some Coyotes fans like to drive up close to the field in their trucks and watch from there, the school designated one primo parking spot for Cantrell — reserved with a hand-printed cardboard sign — and she watches from her car with the windows rolled up. She let a friend take her to last week’s game, but said she often makes the drive herself. The Richland Springs booster club operates a souvenir trailer to keep fans stocked with the latest window stickers, caps and T-shirts (“3 out of 4 … looking for more”). Seating on the home side at Coyote Field is coveted, and some fans stake an early claim by placing a blanket or seat cushion in the stands a few hours before kickoff. In the recent 56-6 victory over Robert Lee, the Coyotes ran up 431 yards on 32 plays to the Steers’ 195 on 41. 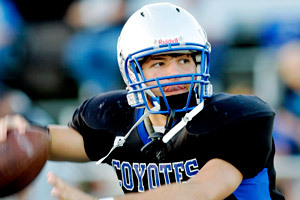 If the Coyotes feel the pressure of all the state titles and the regular-season winning streak, it doesn’t show. Indeed, the amount of open space often results in plays that appear to be stopped for short gains turning into long touchdown runs when a ball carrier eludes a tackle and reverses to the unoccupied side of the field. Six-man players don’t often play college football. The most fabled six-man product in Texas is Jack Pardee, who played at little Christoval in the early 1950s before starring for Bear Bryant at Texas A&M and playing and coaching in the NFL. Brian Ford from Calvert currently is a senior linebacker for Stephen F. Austin, a Football Championship Subdivision (formerly Division I AA) program located in eastern Texas. Two members of the Richland Springs championship teams are freshmen at Sul Ross State, a Division III school (no athletic scholarships) located in the Big Bend area of Texas near the Mexican border. One of those two players is Tyler Ethridge, who was the most valuable player in the championship game as a freshman, junior and senior. Rosters might be smaller in six-man, but they play with the same amount of heart. Calvert coach Coylin Grimes said his star fullback-linebacker, senior Travis Walker, is attracting the attention of TCU and North Texas. Texas Tech is the one major college program located in the middle of six-man country. And coach Mike Leach runs a high-flying offense that often looks similar to six-man play. But Leach said it’s unlikely he’d seriously consider giving a six-man player a scholarship. Such observations are frustrating to Lyle Campbell, who starred in six-man at Gordon in the late 1990s and became an honorable mention All-Ivy League linebacker at Dartmouth in 2003. If moving into college ball remains difficult for six-man alums, Richland Springs coach Burkhart is trying to help the cause at the younger end of the player pool. This fall, he started what might be the first six-man peewee program. It includes fifth-graders and younger in Richland Springs, Cherokee and nearby Lometa and Rochelle. The six-man peewee “Super Bowl” is scheduled for Nov. 8. Jed Tedder is a Cherokee resident who helps coach the town’s peewee flag football team, which tops out with second-graders. He spends a lot of time tying shoelaces, but is proud that the kids have stuck with the program throughout the season. The future of six-man football is getting an earlier start. Jeff Miller is a freelance writer in Texas.